The Boston Terrier is a breed of dog originating in the United States of America. This "American Gentleman" was accepted in 1893 by the American Kennel Club as a non-sporting breed. Color and markings are important when distinguishing this breed to the AKC standard. They should be either black, brindle or seal with white markings. Bostons are small and compact with a short tail and erect ears. The AKC says they are highly intelligent and very easily trained. They are friendly and can be stubborn at times. The average life span of a Boston is around 11 to 13 years, though some can live well into their teens. The Boston terrier breed originated around 1870, when Robert C. Hooper of Boston, purchased from Edward Burnett a dog named Judge (known later as Hooper's Judge), which was of a Bull and Terrier type lineage. Hooper's Judge is either directly related to the original Bull and Terrier breeds of the 19th and early 20th centuries, or Judge is the result of modern English Bulldogs being crossed into terriers created in the 1860s for show purposes, like the White English Terrier. 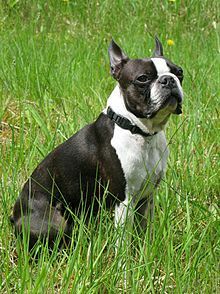 The American Kennel Club cites Hooper's Judge as the ancestor of almost all true modern Boston Terriers. Judge weighed over 27.5 pounds (12.5 kg). The offspring interbred with one or more French Bulldogs, providing the foundation for the Boston Terrier. Bred down in size from fighting dogs of the Bull and Terrier types, the Boston Terrier originally weighed up to 44 pounds (20 kg) (Olde Boston Bulldogge). The breed was first shown in Boston in 1870. By 1889 the breed had become sufficiently popular in Boston that fanciers formed the American Bull Terrier Club, the breed's nickname, "roundheads". Shortly after, at the suggestion of James Watson (a noted writer and authority), the club changed its name to the Boston Terrier Club and in 1893 it was admitted to membership in the American Kennel Club, thus making it the first US breed to be recognized. It is one of a small number of breeds to have originated in the United States. The Boston Terrier was the first non-sporting dog bred in the US. In the early years, the color and markings were not very important. By the 20th century the breed's distinctive markings and color were written into the standard, becoming an essential feature. The Boston Terrier has lost most of its aggressive nature, preferring the company of humans, although some males will still challenge other dogs if they feel their territory is being invaded. Boston University's mascot is Rhett the Boston Terrier. The Boston Terrier is also the mascot of Wofford College in Spartanburg, S.C. The Boston Terrier is a compactly built, well-proportioned dog. It has a square-looking head with erect ears and a slightly arched neck. The muzzle is short and generally wrinkle-free, with an even or a slightly undershot bite. The chest is broad and the tail is short. According to international breed standards, the dog should weigh no more than 25 pounds (11 kg). Boston Terriers usually stand up to 15-17 inches at the withers. The Boston Terrier is characteristically marked with white in proportion to either black, brindle, seal (color of a wet seal, a very dark brown that looks black except in the bright sun), or a combination of the three. Any other color is not accepted as a Boston Terrier by the American Kennel Club, as they are usually obtained by crossbreeding with other breeds and the dog loses its characteristic "tuxedo" appearance. According to the American Kennel Club, an ideal Boston Terrier should have white that covers its chest, muzzle, band around the neck, halfway up the forelegs, up to the hocks on the rear legs, and a white blaze between (but not touching) the eyes. For conformation showing, symmetrical markings are preferred. Due to the Boston Terrier's markings resembling formal wear, in addition to its refined and pleasant personality, the breed is commonly referred to as the "American Gentleman." The Boston Terrier's large, prominent pair of eyes is a distinguishable feature. The breed's round eyes are set widely apart, are large in size, and located squarely in the skull. The breed's genetic makeup produces a short tail. These short tails can take the shape of a corkscrew, or curl, or they can be straight. Generally, Boston Terriers' tails do not exceed two inches in length. Boston is a gentle breed that typically has a strong, happy-go-lucky, and friendly personality with a merry sense of humour. Bostons are generally eager to please their owner and can be easily trained. They can be very protective of their owners, which may result in aggressive and territorial behavior toward other pets and strangers. The breed requires only a minimal amount of grooming. Curvature of the back, called roaching, might be caused by patella problems with the rear legs, which in turn causes the dog to lean forward onto the forelegs. This might also just be a structural fault with little consequence to the dog. Due to their shortened muzzles, many Boston Terriers cannot tolerate excessively hot or cold weather and demanding exercise under such conditions can cause them harm. A sensitive digestive system is also typical of Boston Terriers with flatulence commonly being associated with poor diet in the breed. Their large and prominent eyes make Boston Terriers prone to corneal ulcers. Due to the breed being characterized by a short muzzle paired with a large pair of eyes, their eyes are susceptible to injury when making contact with sand, dust, debris, or sharp objects, such as plants with thorns. Bostons are brachycephalic breeds. The word comes from Greek roots "Brachy," meaning short and "cephalic," meaning head. This anatomy can cause tiny nostrils, long palates and a narrow trachea. Bostons may be prone to snoring and reverse sneeze—a rapid and repeated forced inhalation through the nose—accompanied by snorting or gagging sounds used to clear the palate of mucus, which does not harm the dog in any way. Brachycephalic dogs may be prone to complications with general anesthesia. Bostons frequently require caesarean section to give birth, with over 90% of litters in a UK Kennel Club survey delivered this way. With a short, shiny, smooth coat, Boston Terriers require little grooming. Bostons produce light shedding, and weekly brushing of their fine coat is effective at removing loose hair. Brushing promotes the health of the coat because it distributes skin oils, and it also encourages new hair growth. Occasional bathing is suitable for the low-maintenance breed. The nails of Boston Terriers require regular trimming. Overgrown nails not only have the potential to inflict pain on the breed, but they can also make walking difficult or tear off after getting snagged on something. Similarly to nail trimming, teeth brushing should also be done regularly to promote good oral health. The risk of the breed developing oral pain, gum infection, or bad breath can be decreased with regular teeth brushing that removes plaque buildup and other bacteria. In the past, Bostons were primarily pit-fighting dogs, but with their friendly and happy temperament, they became companion dogs. In 2012, a high school student named Victoria Reed took the advice of her veterinarian and submitted a photo of her Boston Terrier, Bruschi, to Guinness World Records. With each eye being 1.1 inches, or 28 mm, in diameter, Bruschi is recognized by Guinness to be the dog with the largest eyes. In 1921 at a ceremony to commemorate the United States' 102nd Infantry, the U.S. Army awarded a gold medal to an honorable war dog: Sergeant Stubby. The Bull Terrier, possessing three service stripes and one wound stripe, was given rank in the U.S. Army-making him the first dog to ever earn it. The comforting, protective war dog was also rewarded a medal by France. Sergeant Stubby died in 1926 with the legacy of being the United States' "greatest war dog." ^ "Boston Terrier". Animal World. ^ a b c d e Meade, Scottee (2000). The Boston Terrier: An Owner's Guide to a Happy Healthy Pet. Howell Book House. ISBN 1-58245-159-1. ^ a b c d "Boston Terrier Dog Breed Information". Akc.org. Retrieved 11 December 2017. ^ "Boston Terrier - American Kennel Club". Akc.org. ^ "The Boston Terrier Club Of America". Bostonterrierclubofamerica.org. ^ "Most Popular Dog Breeds - Full Ranking List". Akc.org. Retrieved 11 December 2017. ^ "Boston Terrier Dog Breed Information and Pictures". Dogbreedinfo.com. Retrieved 11 December 2017. ^ a b Boston Terrier Club of America. "Boston Terrier eyes". Boston Terrier Club of America. Retrieved April 26, 2018. ^ a b Chester, Jo. "Do Boston Terriers' tails curl?". The Nest. Retrieved May 10, 2018. ^ "Boston Terrier". Easy Pet MD. Retrieved May 10, 2018. ^ a b c d "Boston Terrier". Vet Street. Retrieved May 9, 2018. ^ Cline, Mrs. Charles D. (1995). Boston Terriers. T.F. H. Publications, Inc. ISBN 0-7938-2397-8. ^ "Boston Terrier - Temperament & Personality". Petwave.com. Retrieved 11 December 2017. ^ "Boston Terrier Dog Breed Information, Pictures, Characteristics & Facts – Dogtime". Dogtime.com. Retrieved 11 December 2017. ^ "Brachycephalic". marvistavet.com. Archived from the original on 2007-12-22. ^ "Health Concerns: Respiratory System". Animal Health Center. New Jersey Veterinary Medical Association. Archived from the original on 2007-05-18. Retrieved 2007-04-06. ^ Evans, K.; Adams, V. (2010). "Proportion of litters of purebred dogs born by caesarean section" (PDF). The Journal of small animal practice. 51 (2): 113–118. doi:10.1111/j.1748-5827.2009.00902.x. PMID 20136998. Archived from the original (PDF) on 2016-04-06. ^ Wedderburn, Peter (6 April 2009). 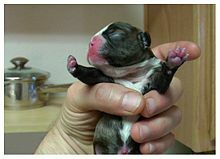 "Why do over 80 per cent of Bulldog births happen by caesarian section?". The Daily Telegraph. Retrieved 28 March 2011. ^ a b c d e "Boston Terrier". AKC. Retrieved May 10, 2018. ^ a b Bedwell-Wilson, Wendy. "Boston Terrier health watch: teeth, gums, and jaw". Dummies. Retrieved May 10, 2018. ^ "Boston Terrier". Dog Time. Retrieved May 10, 2018. ^ "Boston Terrier". Dog Breed Plus. Retrieved May 10, 2018. ^ a b Moye, David (May 26, 2012). "World's largest dog eyes: Bruschi the Boston Terrier eyeballs world record". Huffington Post. Archived from the original on April 28, 2017. Retrieved April 3, 2018. ^ a b c d Kane, Gillian. "Sergeant Stubby". Slate. Retrieved May 10, 2018. Bulanda, Susan (1994). Boston Terriers. Barron's Educational Series, Inc. ISBN 0-8120-1696-3. Wikimedia Commons has media related to Boston Terrier. Wikisource has the text of the 1920 Encyclopedia Americana article Boston Terrier. “The Boston Terrier” in The power of the dog by Arthur Croxton Smith. 1910.